"Then you don't remember. This is not the exact spot." I was only twenty meters from the wall, and I still saw nothing. 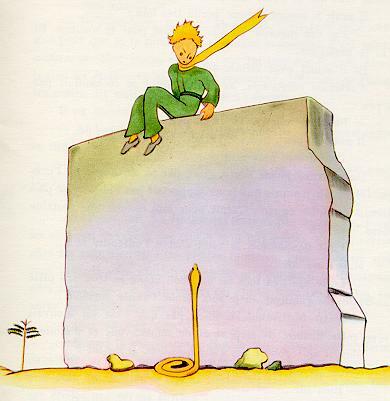 I dropped my eyes, then, to the foot of the wall--and I leaped into the air. 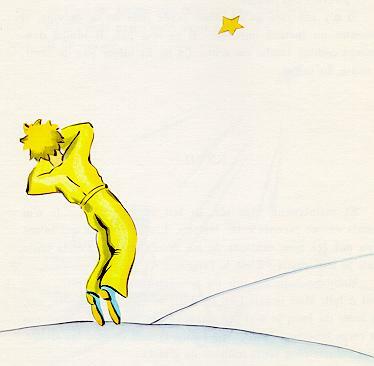 There before me, facing the little prince, was one of those yellow snakes that take just thirty seconds to bring your life to an end. Even as I was digging into my pocked to get out my revolver I made a running step back. But, at the noise I made, the snake let himself flow easily across the sand like the dying spray of a fountain, and, in no apparent hurry, disappeared, with a light metallic sound, among the stones. I had loosened the golden muffler that he always wore. I had moistened his temples, and had given him some water to drink. And now I did not dare ask him any more questions. He looked at me very gravely, and put his arms around my neck. I felt his heart beating like the heart of a dying bird, shot with someone's rifle . . . I was just coming to tell him that my work had been successful, beyond anything that I had dared to hope. "I, too, am going back home today . . ."
"It is much farther . . . It is much more difficult . . ."
I realized clearly that something extraordinary was happening. I was holding him close in my arms as if he were a little child; and yet it seemed to me that he was rushing headlong toward an abyss from which I could do nothing to restrain him . . .
"I have your sheep. And I have the sheep's box. And I have the muzzle . . ."
And he gave me a sad smile. "Dear little man," I said to him, "you are afraid . . ."
"I shall be much more afraid this evening . . ."
"Tonight, it will be a year . . . My star, then, can be found right above the place where I came to the Earth, a year ago . . ."
"Little man," I said, "tell me that it is only a bad dream--this affair of the snake, and the meeting-place, and the star . . ."
"The thing that is important is the thing that is not seen . . ."
"Yes, I know . . ."
"It is just as it is with the flower. If you love a flower that lives on a star, it is sweet to look at the sky at night. All the stars are a-bloom with flowers . . ."
"It is just as it is with the water. Because of the pulley, and the rope, what you gave me to drink was like music. You remember--how good it was." "And at night you will look up at the stars. Where I live everything is so small that I cannot show you where my star is to be found. It is better, like that. My star will just be one of the stars, for you. And so you will love to watch all the stars in the heavens . . . they will all be your friends. And, besides, I am going to make you a present . . ."
"That is my present. Just that. It will be as it was when we drank the water . . ."
"All men have the stars," he answered, "but they are not the same things for different people. For some, who are travelers, the stars are guides. For others they are no more than little lights in the sky. For others, who are scholars, they are problems. For my businessman they were wealth. But all these stars are silent. You--you alone--will have the stars as no one else has them--"
"In one of the stars I shall be living. In one of them I shall be laughing. And so it will be as if all the stars were laughing, when you look at the sky at night . . . You--only you--will have stars that can laugh!" "And when your sorrow is comforted (time soothes all sorrows) you will be content that you have known me. You will always be my friend. You will want to laugh with me. And you will sometimes open your window, so, for that pleasure . . . And your friends will be properly astonished to see you laughing as you look up at the sky! Then you will say to them, 'Yes, the stars always make me laugh!' And they will think you are crazy. It will be a very shabby trick that I shall have played on you . . ."
"It will be as if, in place of the stars, I had given you a great number of little bells that knew how to laugh . . ."
"Tonight--you know . . . Do not come." "I shall look as if I were suffering. I shall look a little as if I were dying. It is like that. Do not come to see that. It is not worth the trouble . . ."
"I tell you--it is also because of the snake. He must not bite you. Snakes--they are malicious creatures. This one might bite you just for fun . . ."
"Ah! You are there . . ."
"It was wrong of you to come. You will suffer. I shall look as if I were dead; and that will not be true . . ."
"You understand . . . it is too far. I cannot carry this body with me. It is too heavy." "But it will be like an old abandoned shell. There is nothing sad about old shells . . ."
"You know, it will be very nice. I, too, shall look at the stars. All the stars will be wells with a rusty pulley. All the stars will pour out fresh water for me to drink . . ."
"That will be so amusing! You will have five hundred million little bells, and I shall have five hundred million springs of fresh water . . .
And he too said nothing more, becuase he was crying . . .
"You know--my flower . . . I am responsible for her. And she is so weak! She is so na�ve! She has four thorns, of no use at all, to protect herself against all the world . . ."
"There now--that is all . . ."